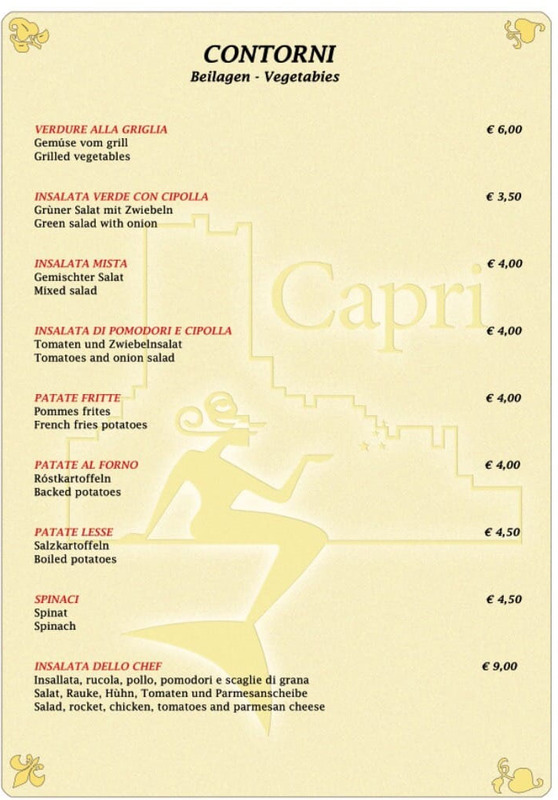 The restaurant Capri is located in the heart of Malcesine, on Garda Lake. 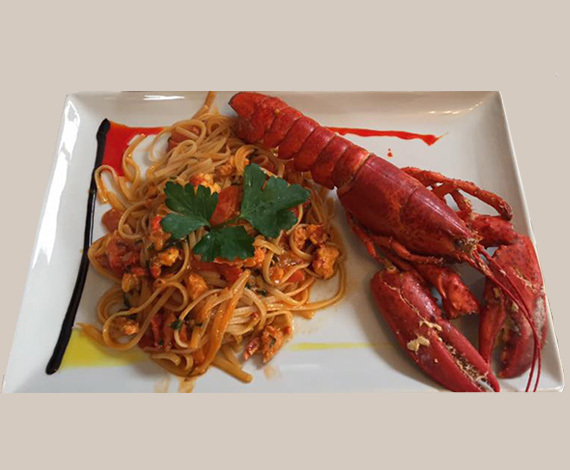 Our kitchen offers typical Italian dishes but also specialties from sea and lake. 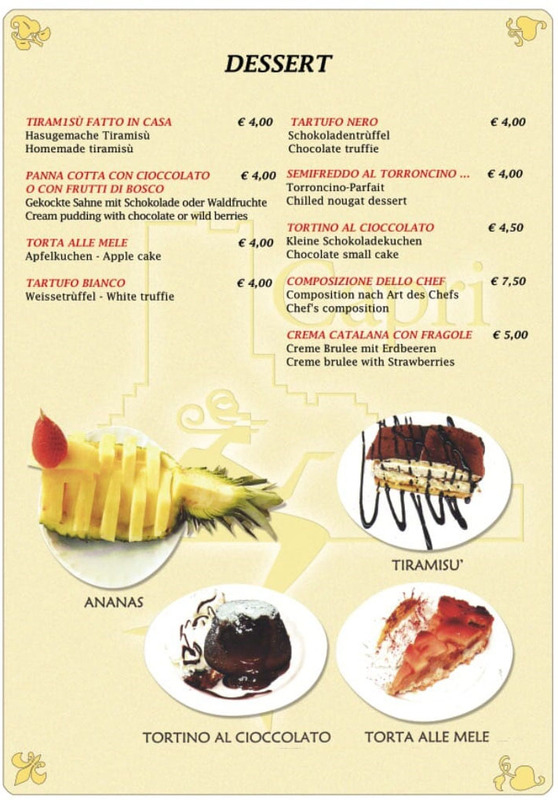 All our qualified and professional staff form the foundation with their excellent gastronomic experience in our restaurant. 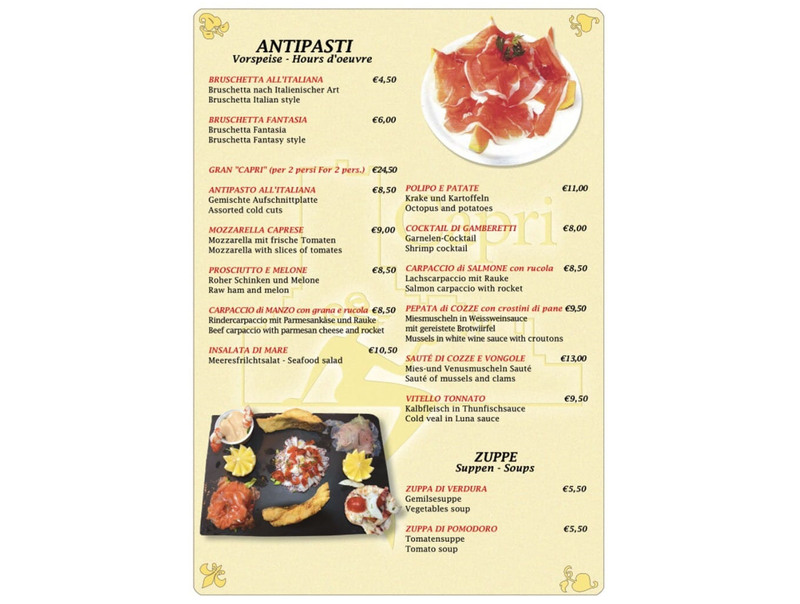 We are also proud to accompany you in the discovery of our culinary world. 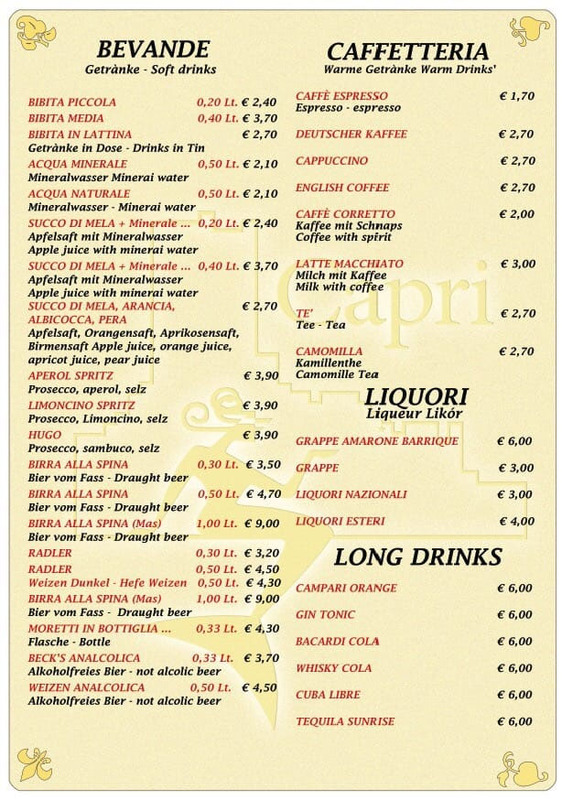 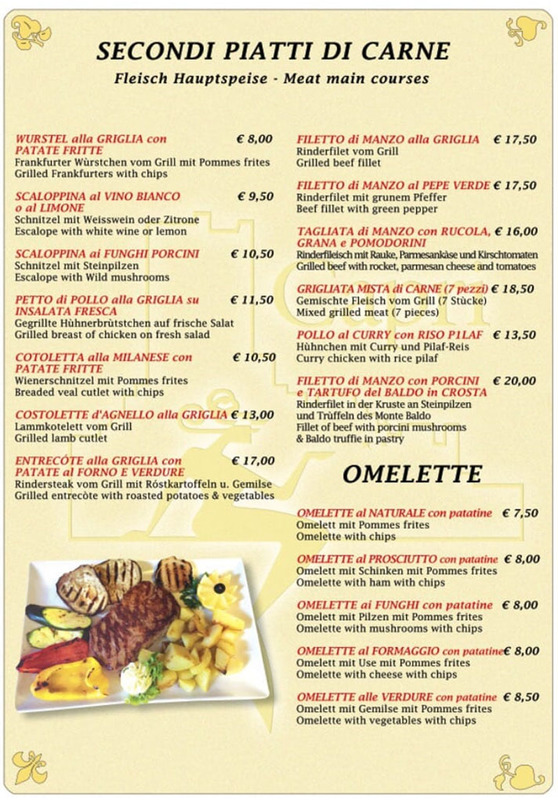 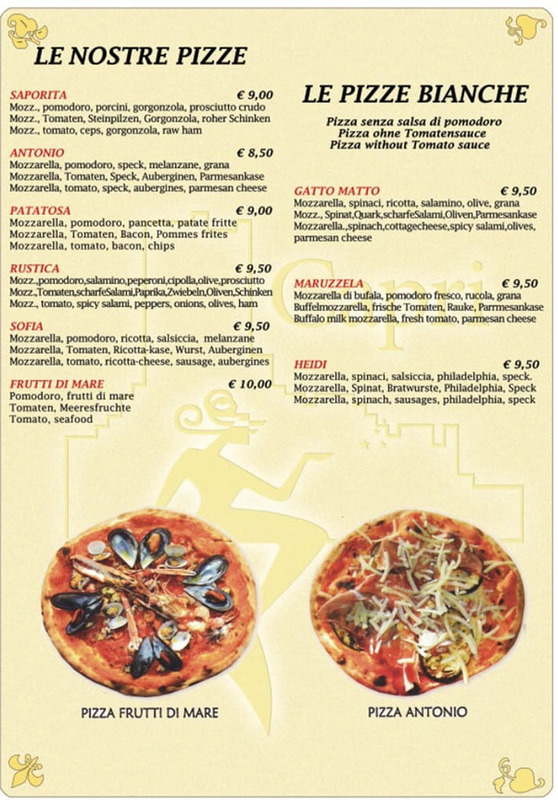 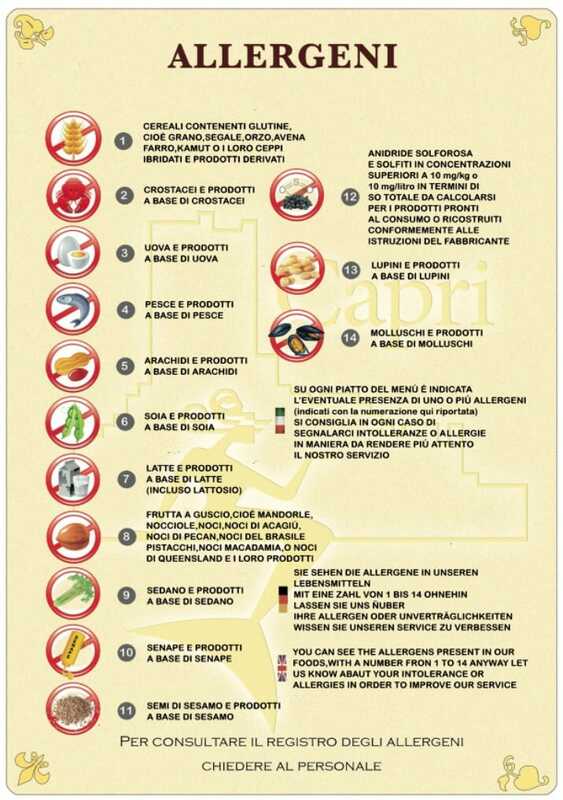 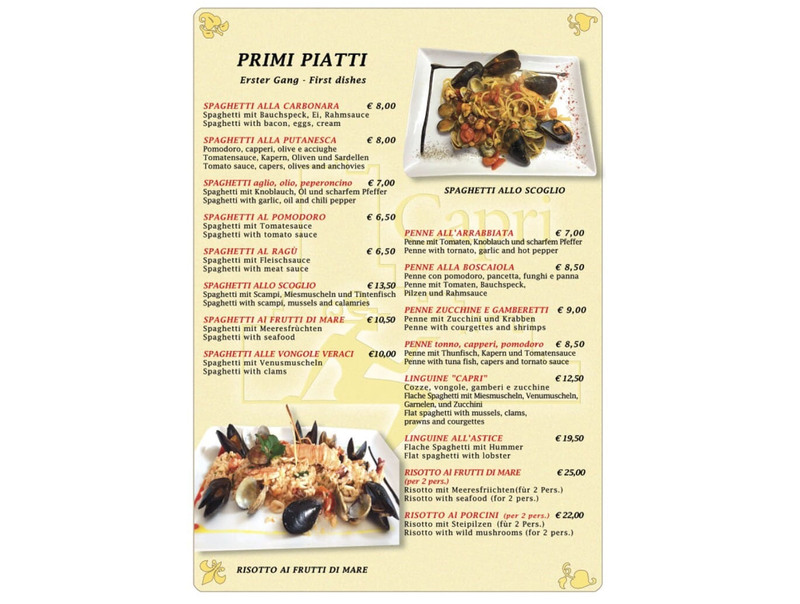 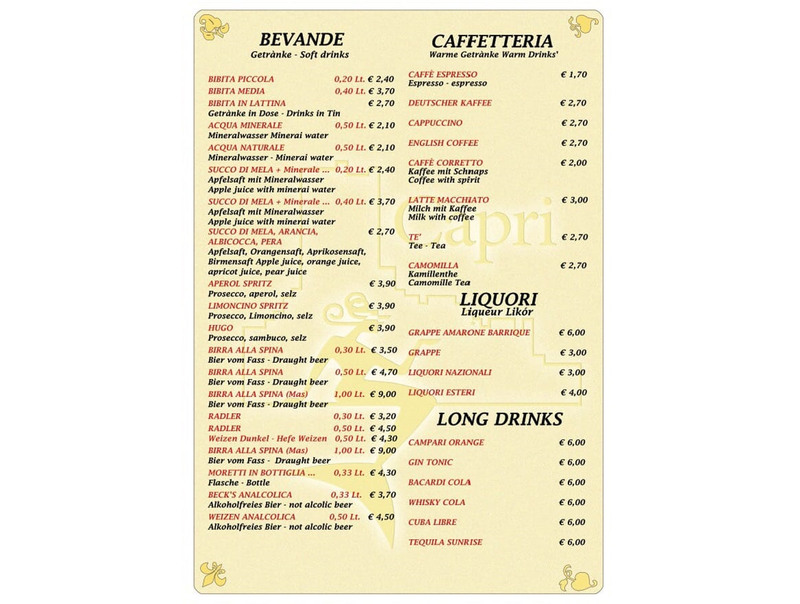 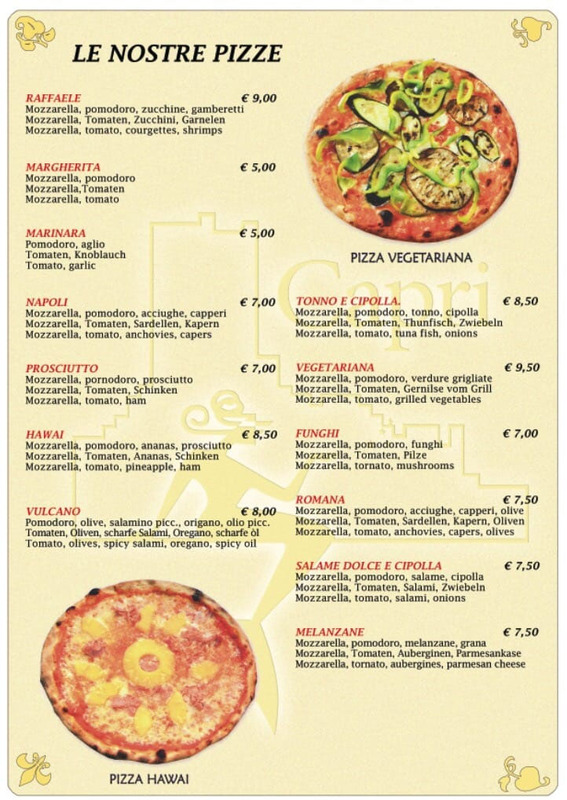 Our menu is very extensive and based on the entire Italian gastronomic tradition - it will satisfy all your needs. 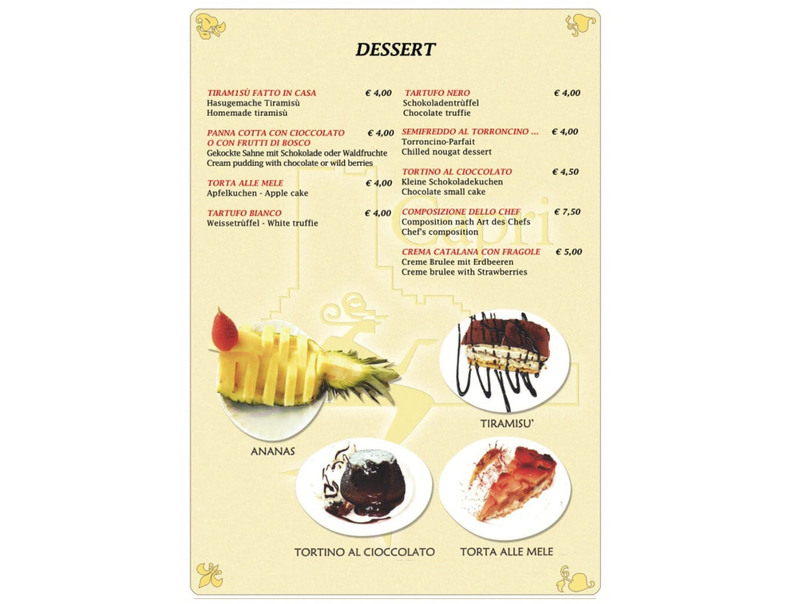 The ingredients we use are the highest quality; we use them to create starters, main courses and desserts in our kitchen. 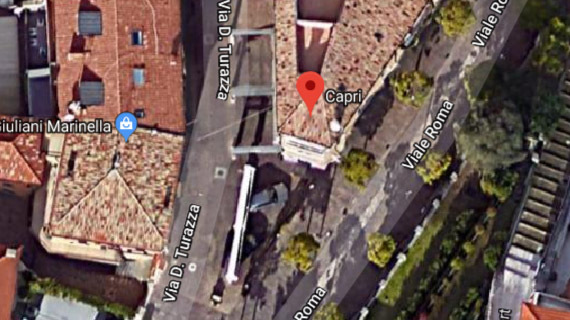 The owner Raffaele Lo Giudice, together with the pizza chef and the chef, led his restaurant Capri to one of the most popular and well-known restaurants in Malcesine, during the last 15 years. 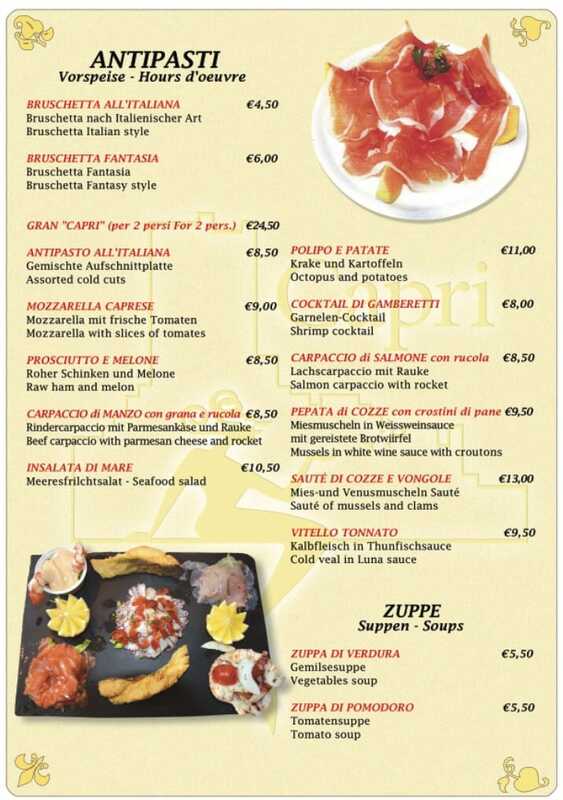 Our culinary experience at Restaurant Capri is based on the tradition of the best Italian fish cuisine. 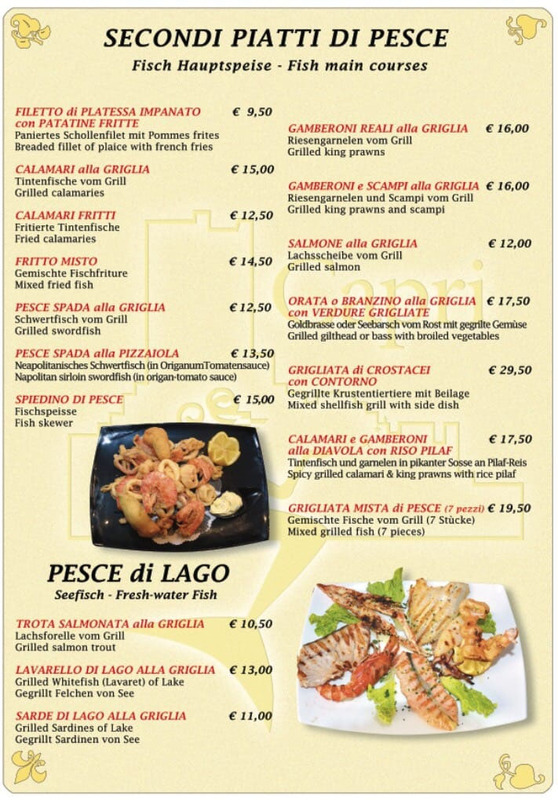 We offer seafood and lake specialities. 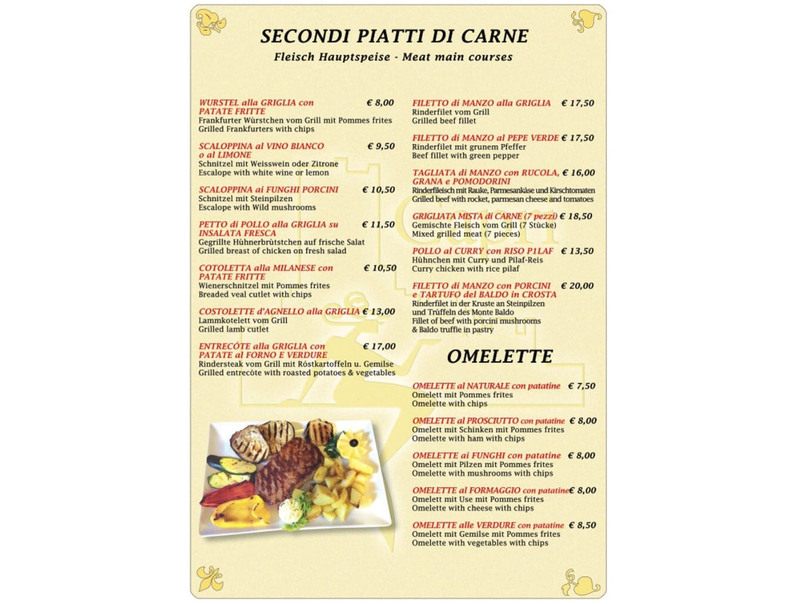 Both first and second courses are carefully prepared by selecting the best ingredients. 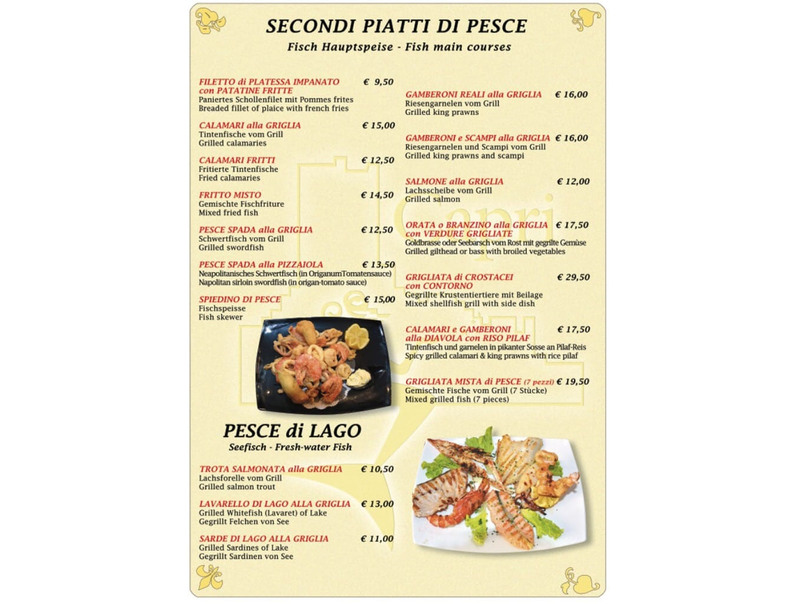 Among the appetizers we recommend seafood dried with bread crust, red Nostromo Maccheroniand olive leaves Mediterranean style. 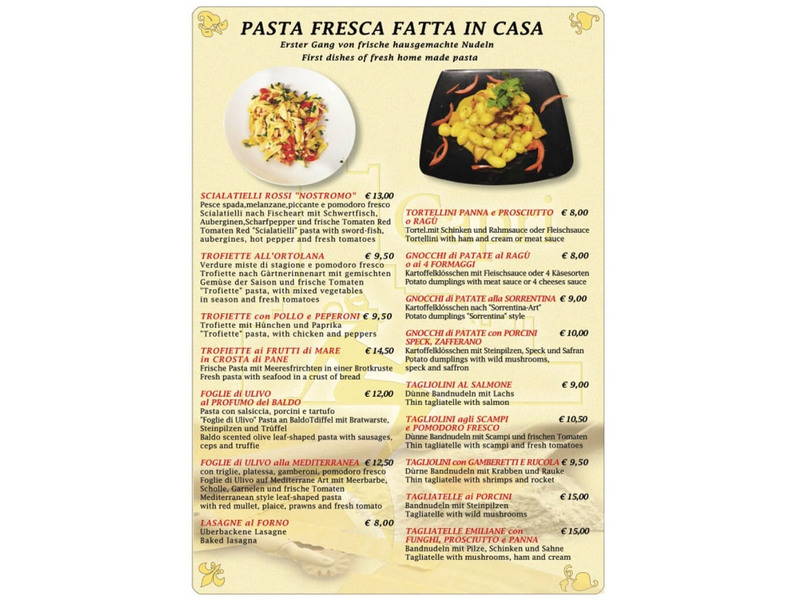 The world famous and appreciated dishes such as lasagne, spaghetti carbonara and pasta bolognese are prepared according to traditional Italian methods. 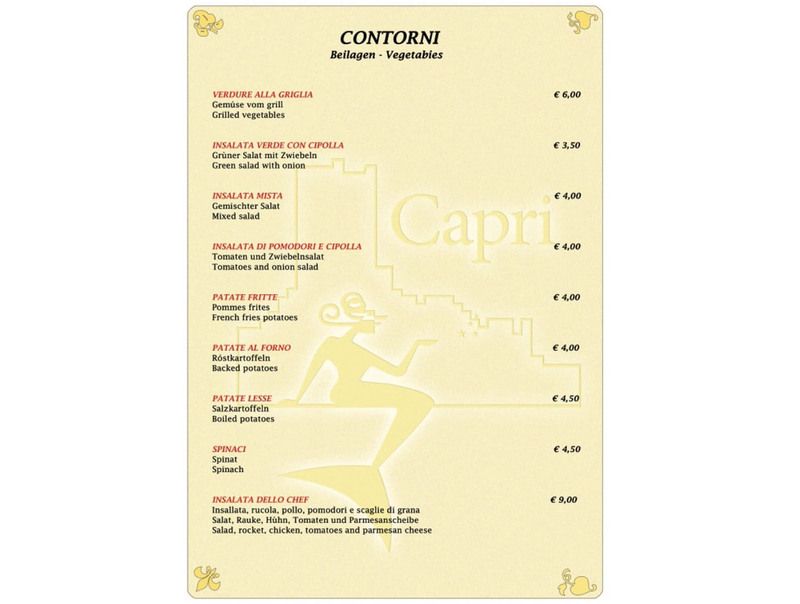 Capri's cuisine also offers numerous second courses with meat and fish. 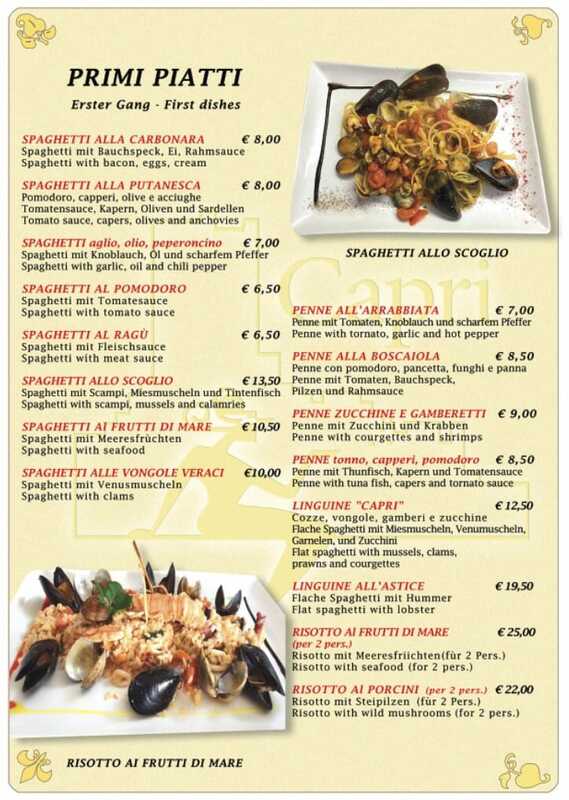 The main courses of the sea include grilled shellfish, grilled fish, sardines and grilled sea fish, as well as mixed fried seafood. 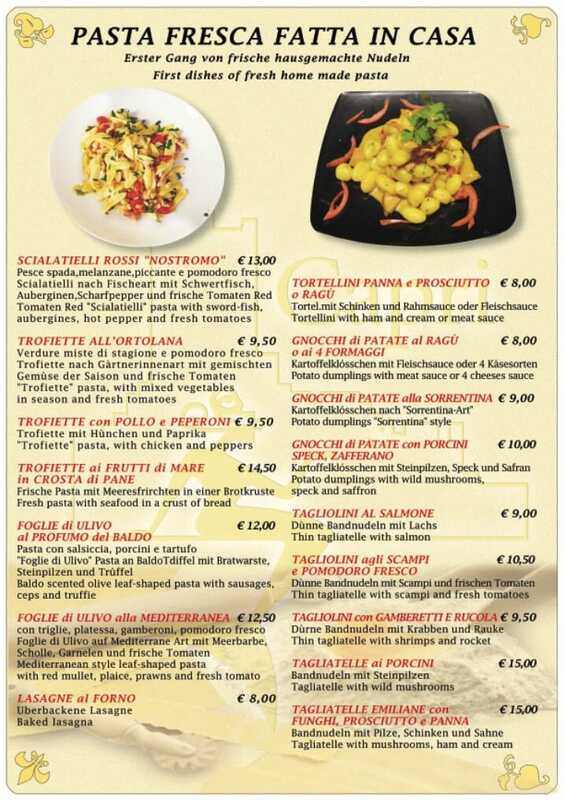 Gluten-free courses are also available on request. 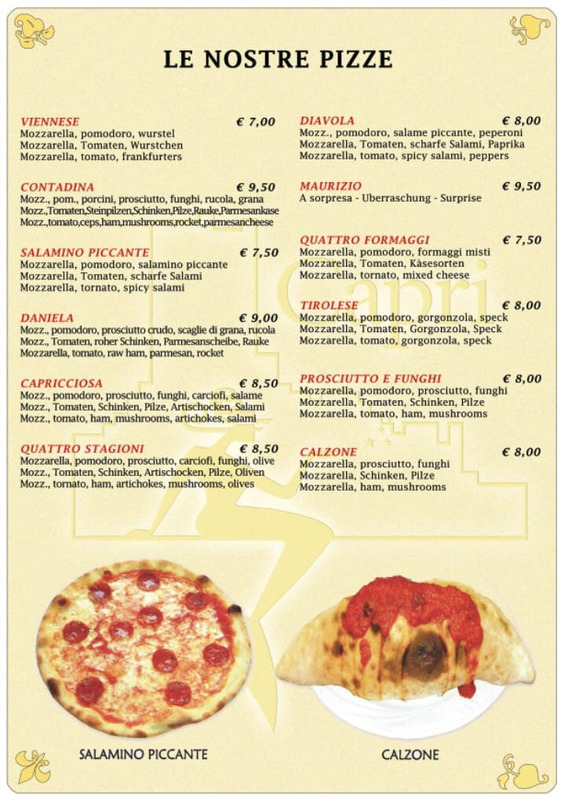 The Capri is specialized in the preparation of classic pizzas with selected ingredients and products of the highest quality. 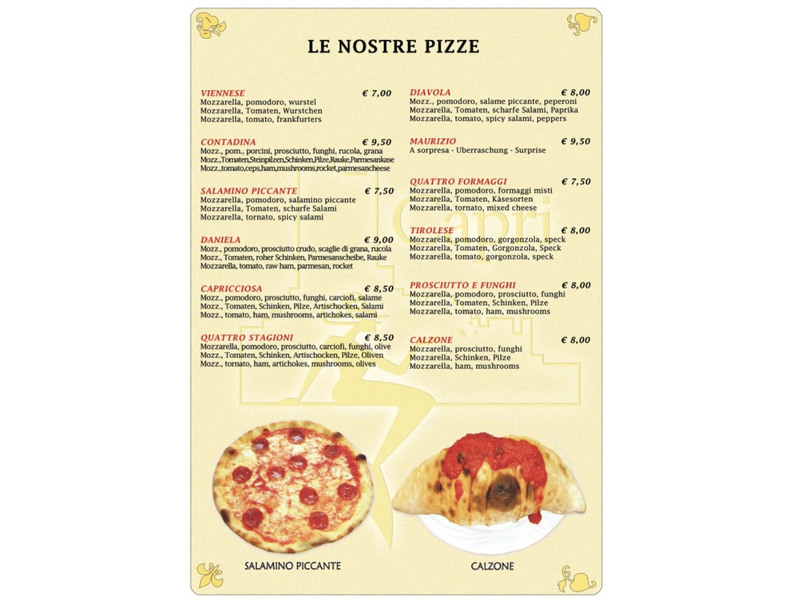 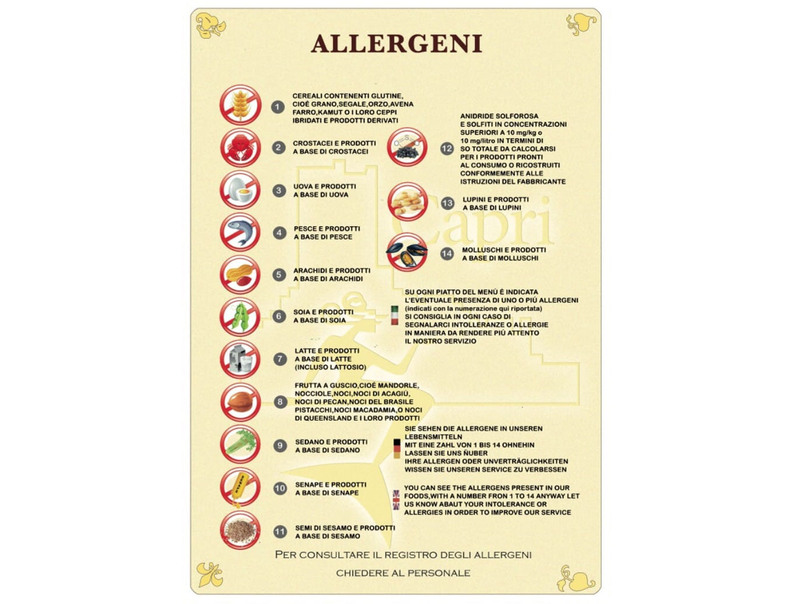 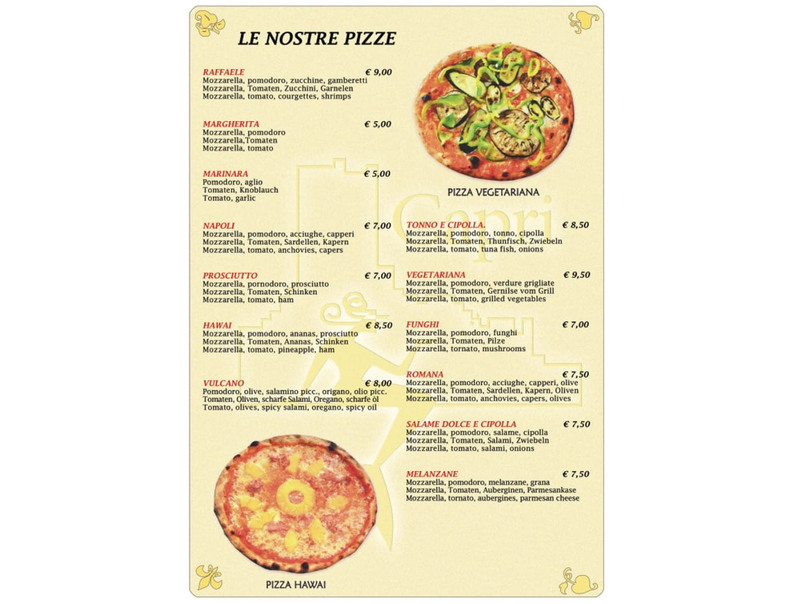 The wide range of spices and possible combinations of ingredients for pizzas makes the product range very diverse. 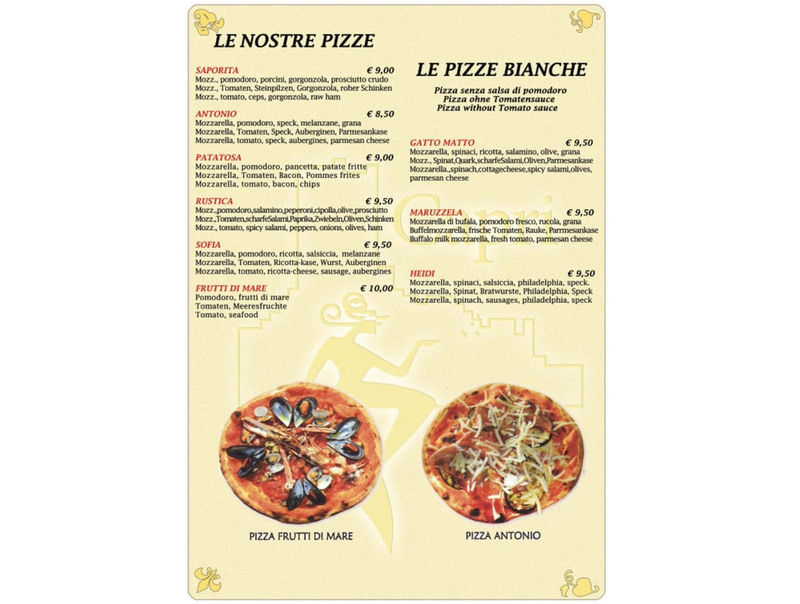 All our pizzas are made from a dough which is subject to a sourdough process of at least 24 hours and thus guarantees a high digestibility for adults and children. 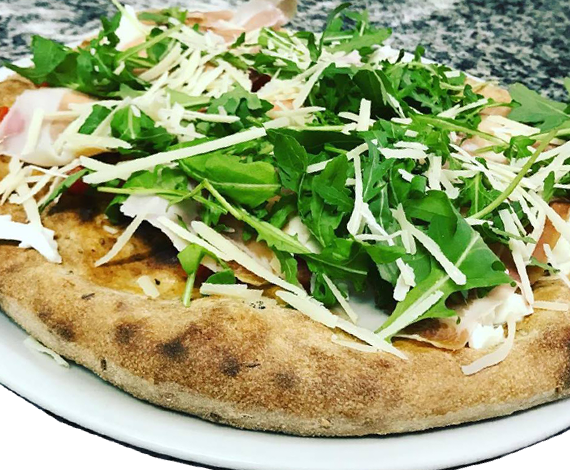 Our highly skilled pizza chef, with more than ten years of experience, will create the classic, thin and crispy pizza for you, satisfying the needs of every gourmet.